Rocket Lab launch team member Kieran Fanning took this photo of the company's Electron rocket at night ahead of its planned "It's Business Time" launch from Māhia Peninsula, New Zealand on June 23, 2018. Update for June 28: Rocket Lab announced today that "It's Business Time" will not launch during the planned 14-day launch window (June 22–July 6) due to an issue with the Electron rocket's motor controller. The company has not yet announced a new launch window at this time. An earlier launch attempt on June 26 was scrubbed when Rocket Lab discovered the the motor controller issue. The first launch attempt on June 22 was also called off due to a technical glitch with a tracking dish needed to monitor the launch. The U.S. spaceflight startup Rocket Lab will attempt the first commercial launch of its new Electron rocket today (June 22), and you can watch the liftoff live online. 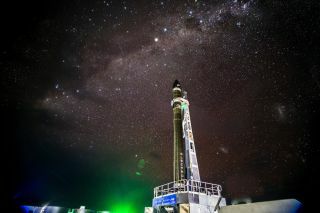 Topped with four commercial satellites and one technology demonstration — a drag sail designed to deorbit small satellites and reduce space junk — the Electron rocket will lift off from the company's private launch site on Māhia Peninsula in New Zealand. The 4-hour launch window opens at 8:30 p.m. EDT (12:30 p.m. local time or 0030 GMT on June 23). You can watch a live webcast of the launch here on Space.com, courtesy of Rocket Lab, or directly via the company's website. Rocket Lab will begin its live coverage 20 minutes before liftoff, or 8:10 p.m. EDT (12:10 p.m. local time or 0010 GMT on June 23). This mission, which the company has named "It's Business Time," follows two test flights of the Electron rocket. The craft's debut flight, "It's a Test," launched on May 25, 2017, and made it to space, but the rocket didn't reach the desired altitude. A follow-up flight on Jan. 21, dubbed "Still Testing," was considered successful, despite a series of launch aborts and delays caused by weather and wayward boats, among other things. Rocket Lab initially aimed to launch the "It's Business Time" mission April 19, but postponed it after spotting "unusual motor controller behaviour" during a launch dress rehearsal. The company spent the following weeks confirming the Electron was ready to fly for its customers. To mark "It's Business Time," Rocket Lab launch team member Kieran Fanning snapped a spectacular photo of the Electron booster on its seaside launchpad in New Zealand. "Given the weather had been mostly cloudy earlier on in the day, I wasn't really anticipating the chance to get a shot like this," Fanning told Space.com via email. "As we neared the end of operations for the wet dress rehearsal, the clouds opened up to reveal the skies above and I knew this was probably my best ever opportunity. I quickly ran to get my gear and used a concrete block to prop the camera up and started snapping before the clouds rolled in about ten minutes later. Absolutely a case of right time, right place, and right-ish gear!" Lemur-2-Zupanski and Lemur-2 Chanusiak: Two nanosatellites for the data analytics company Spire that join a constellation in orbit for ocean vessel tracking. GeoOptics nanosatellite: Built by Tvak Nanosatellite Systems, this small satellite will be used for weather monitoring by GeoOptics Inc.
NABEO: A drag-sail technology demonstration satellite to test a space debris removal method. It was built by High Performance Space Structure Systems. If Rocket Lab scrubs or delays today's liftoff, the company still has a 14-day launch window for this mission. That means it could launch any day between now and July 6.